I AM FUEL, YOU ARE FRIENDS: It's just madness. Boulder madness. It's just madness. Boulder madness. Freshly back from the annual summit of record label and radio folks up in Boulder (I didn't fit into either category; I just happily observed and chit-chatted, gratefully partaking in a bunch of good showcase shows). First up was the side-achingly-hilarious Matt Nathanson, rocking through a solid set of mostly new material which sounded fantastic. Even though he had to face an oddly pugilistic audience, he handily slayed them all with his sharp wit, leaving one golf-shirted middle-aged heckler kind of speechless (the guy made some random crack about Matt "giving it up" in prison, to which I believe Matt called him a big hairy beast and told him to wear something frilly so he had something to grab on to). Despite all the distractions (or maybe because of them), I thought it was a great show. The full band sounds tight and energetic, and the new material has a razor-sharp emotional edge to it that smacks with a welcome realism about long-term relationships. I hope to have a little interview-dealie with him sometime this week, for those of you playing along at home. Matt's new album Some Mad Hope comes out August 14th -- here's one song off it that alternately sounds like his own special Prince nu-wave ditty, mixed seamlessly with the Ryan Adams song "Gimme A Sign." I like it. After Matt Nathanson the place kinda cleared out to go across the street to the sweet little digs of Lulu's Kitchen, a teensy venue with a warm vibe from the owner of Albums On The Hill. Fionn Regan had just completed his set (all I can say is he looked the rockstar part with floppy satin vest and skinny jeans) and Willy Mason was performing an affecting little tune that I understand is new, called "I've Been Waiting For You" (maybe). I'd seen him back at Noise Pop (come to think of it, on a night where I also saw Josh Ritter and ran into Matt Nathanson. WHOA glitch in the matrix). So yes, then Josh Ritter had a late-night set back at the spa/hotel thing where the conference was based, in the Xanadu conference room no joke. I was extremely excited to see this show as the new album is rocking my socks. I sat there all barely-contained with friend Bodie, who was just as excited as me. Bodie lavishes credit upon me for helping to introduce him to Josh's music with Thin Blue Flame back in 05. He owes me. So Josh was circulating through the crowd (dapper, as usual, in his white suit -- he said he likes to "dress for the occasion") and I got a chance to talk to him. What a wonderful, happy human being. He glows with excitement about what he is doing. He also TOTALLY copped to the similarities between new song "Rumors" posted in last week's Monday Music Roundup) and Britney Spears' Toxic. I wouldn't have believed it --I thought it was just me hearing things and being a little too fond of the video-- but I asked and he concurred. His new album The Historical Conquests of Josh Ritter is out August 21 and Amazon just wrote that it "may be the best album of 2007, hands down, by the most under-accorded American musical genius." He blew the crowd away with a set of mostly new material (aka rocking) but also the fantastic "Wolves" and desired "Kathleen" -- oh, and "Girl In The War," which I never tire of. In addition to Some Velvet Blog's Bruce Warren enjoying all the conference festivities alongside me (from the astoundingly good WXPN radio station out in Philly), Wednesday ended with me staying the night, coincidentally enough, at a hotel in Denver with lovely blogger C from Scatter O Light. She was taking a break from her Bono-spotting in NYC to come to Denver for work. It was a blogger bacchanalia. Thursday brought more good live performances, first a luncheon with Robbers on High Street (more from them on Monday) and melodic and wistful Australian rockers Augie March. I mentioned Augie March this past Monday, and they were excellent live - nuanced and passionate and inventive. Their song "One Crowded Hour" fairly takes flight in live performance, and I absolutely adored it and the feelings it evoked in me. I think that song could be huge this summer (it was incidentally re-recorded for the U.S. release at the same studios in San Francisco that Creedence used to work at). After the show Glenn Richards from Augie March used my cell phone to call my little brother at work in San Diego, as he's a huge fan. "Hello Brian? This is Glenn, from Augie March." Officially consider me the world's best big sister now. More pics from that luncheon and the conference here. 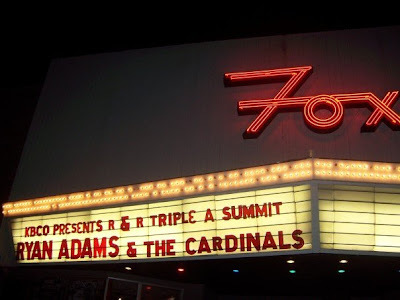 And finally, why not a third Ryan Adams show in two weeks? Why not. This one was shortened, acoustic, and OPENING FOR PAULA COLE. How did that happen? Maybe the artist with the most underarm hair got the top billing. Or something. UPDATE: The whole Thursday night show is now streaming at archive.org. I was bone-crunchingly exhausted after the event was over, partly from the many shows and partly from just the constant talking to interesting people, but I am recovered now. Let's do it next year. Josh Ritter is a seriously nice guy + the white suit is funny. i didnt think this blog was about who should have top billing/ego. who cares who went on first. Music is the reason to go see. Not about ego, I just meant that the order seemed odd to me, as Ryan seemed to be the major crowd-drawer that night and many left after his set. Hey Heather, just wanted to drop a note. I checked out Amos Lee on Friday night at MusikFest. He played 6 new songs, most of which were electric, shockingly enough. But they were all awesome. He said he'll be heading into the studio this fall to try to lay down a new album. I love the post Heather! Meeting you at the Boulder show capped off a fabulous Ryan-filled weekend! Heather -- You're welcome! Nice to meet you at the Boulder show! 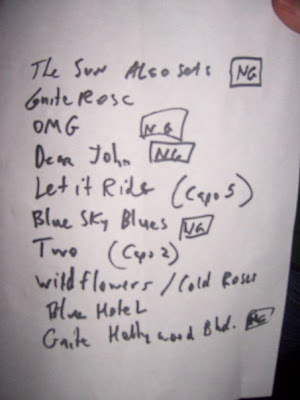 I scored a copy of the set list from the Red Rocks show as well. I think you'll find it very interesting. It's my goal to scan and post it sometime this week. Had my own little Ryan encounter at RR -- not quite as exciting as yours, but I did speak to him! Made my night for sure . . . not to mention the unbelievable show! great post! 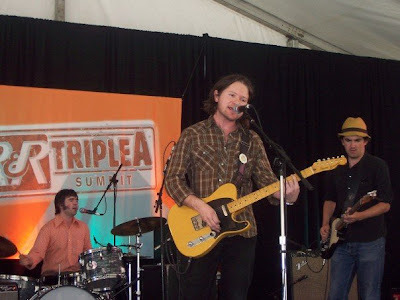 i am giddy in anticipation for both Matt Nathanson and Josh Ritter new albums this month. Did you catch who the new/other guitar player was playing with Josh's band? Hey Heather! Thanks for keeping us updated on Ryan's recent shows. I live in Melbourne, Australia and three nights ago Ryan played a show here - here's the link to my write-up (I've only just started my blog) in case you wanted to check out what he's been up to while down under!